Kansas is unlike any other state in the U.S. It houses fields upon fields of sunflowers, has numerous museums throughout the state dedicated to baseball, art and jazz, and—here’s a kicker—remnants of an 80-million-year-old inland sea. While most cross-country travelers think they’ve seen all of Kansas from their drive on I-70, that tour just scratches the surface. We outlined a potential three-day itinerary, from west Kansas near Colorado to east near Missouri, hitting some of the best spots along the way. We not only included sites you heard about before, but also some of the hidden secrets. You might find out that three days is hardly enough time to see everything Kansas has to offer. What better way to see Kansas than climb to the state&apos;s highest natural point? 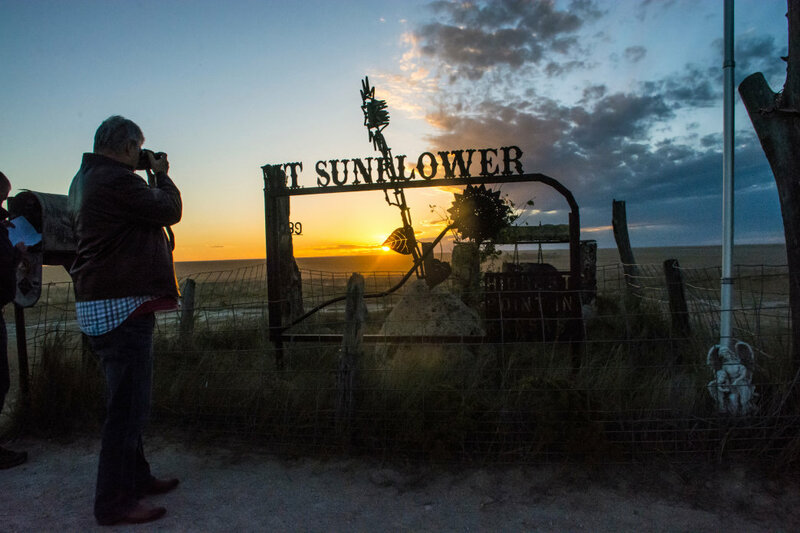 Mount Sunflower—one of Kansas&apos; quirkier sites about 25 miles south of I-70—is 4,039 feet of beauty and about as close to the Colorado/Kansas border as you can get. The site is located on private land, which you have to take dirt roads to access, but its owners—Ed and Cindy Harold—encourage people to visit. They even set up a Little Free Library, a picnic table and a sunflower sculpture to entice passers-by. And after, coffee. Head over to the Clark Crossing Company in Goodland, a bookstore and coffee shop that is a favorite among locals and tourists. For something a little extra, treat yourself to their cinnamon roll latte—you’ve earned it after visiting Mount Sunflower! Once you check Kansas’ high point off your list, get started on your journey toward Goodland. If you are an art enthusiast, you’ll love our next stop. It’s a larger-than-life version of Van Gogh’s famous painting Three Sunflowers in a Vase. You will also get to see a 24-by-32-foot reproduction of the work created by Canadian artist Cameron Cross as part of his Big Easel Project. Beginning to see a theme here with sunflowers? The beloved yellow flower shows up in the state nickname, on the state quarter, the state flag, and in fields throughout Kansas. Next up, 87 miles east, is one of the oldest attractions in the entire state: Monument Rocks. It’s considered one of the Eight Wonders of Kansas. Walking among the chalk monoliths, also called the Chalk Pyramids, is like stepping back in time. Eighty million years ago, the area was part of an inland sea, so take a close look at the formations for shells and other fossils. You can take as many photos as you like, but leave the fossils for others to see. The rocks are on private property, but visitors are welcome. Once you get to Russell, book a room at Lasada at the rustic Black Swan Inn. You will get to sleep inside a dairy barn originally built in 1898—though it has been remodeled since then! The main floor was carved from limestone, and fossilized shells remain visible in the stone, and the wooden beams were carved by hand. It’s a wonderful spot to sit back, relax, and take in one of those famous Kansas sunsets. Lasada also has an on-site restaurant featuring "country gourmet" meals made from scratch. From Russell, head 40 miles south on US-281 to another one of the Eight Wonders of Kansas: Cheyenne Bottoms Wildlife Area. Birdwatchers should definitely bring their binoculars. Test yourself to see how many of 320-plus species of birds you can identify, which includes many threatened and endangered species. If you’re really into birdwatching, or just want a unique birding experience, visit Cheyenne Bottoms in the fall to catch the southward migration. Spend some time scanning one of the largest marshes in the U.S. from the overlook platform, then take a walk on more than 15 miles of gravel paths around the wildlife area. After walking around the marsh, drive 44 miles northeast to Faris Caves near Kanopolis, along the banks of the Smoky Hill River. But don’t worry. You don’t have to be a spelunker to explore these caves. The man-made caves were carved into the sandstone by Charles Griffee, an early settler in 1884. He carved three 12-by-10-foot rooms out of the Dakota Sandstone that you can walk around in. 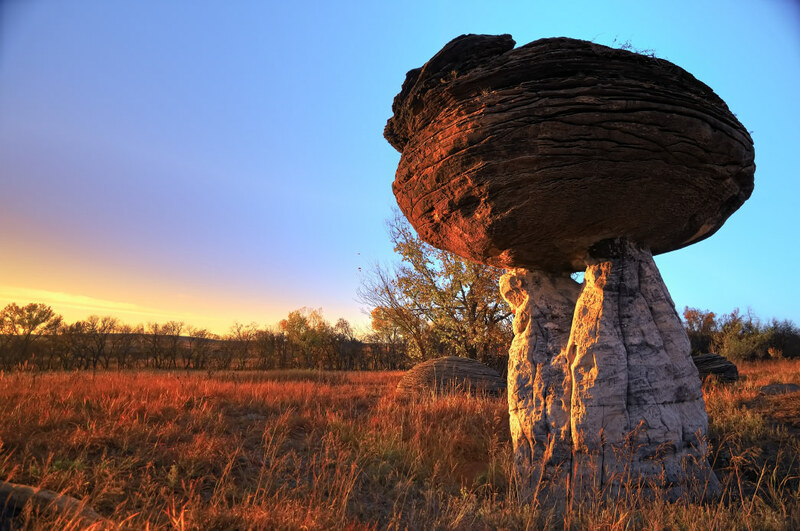 From there, drive another 10 miles northeast to visit Mushroom Rock State Park. It won’t take long to realize how the park got it’s name. Look around the sandstone formations for carvings from Native Americans and early pioneers (though don’t add any new ones!). This is the smallest state park in Kansas, but it’s always open, making it the perfect rest stop on your road trip. End your day about 100 miles southeast with dinner and a hand-crafted pint at one of the state’s finest breweries, Wichita Brewing Company and Pizzeria. Day three is jam-packed, so you’ll want to get a good night’s sleep. Wichita has quite a few options to rest your head, including major hotel chains, campgrounds, and bed and breakfasts. The Inn at Glenstrae is a luxurious option, built in 1900 with a lovely garden and a sense of elegance. College Hill Bed & Breakfast is a cute little spot with everything you might need—WiFi, private bathrooms and a snack bar. After waking up in Wichita, head to the Doo-Dah Diner (calling ahead is recommended) for a filling breakfast. It is open Wednesday through Sunday. The diner, owned by two Wichitans, is one of the most popular spots in town for its made-from-scratch breakfast and lunch meals. You really can’t go wrong with anything on their menu, but seriously, just thinking about their Crab Cake Benedict or their Gluten-Free Banana Bread French Toast makes us start drooling. After a hearty breakfast, head over to the Museum of World Treasures—one of the coolest museums in the country. There are three floors full of random exhibits from around the world— including mummies, historical and presidential exhibits, antiques, dinosaur remains, and other oddities. When you’re ready to hit the road, "we’re off to see the Wizard!" It’s about two hours from Wichita to Wamego, so you may want to take I-35 N up to Emporia and stop for lunch at Radius Brewing Company. It’s just off the highway, making Radius really easy to get to, and they have great food and beer (as long as you aren’t the one doing the driving!). There are tolls between Wichita and Emporia, so if you want to avoid them, grab a cup of in-house roasted joe at Reverie Coffee Roasters on E. Douglas Avenue before you head out from Wichita and drive up 77-N. 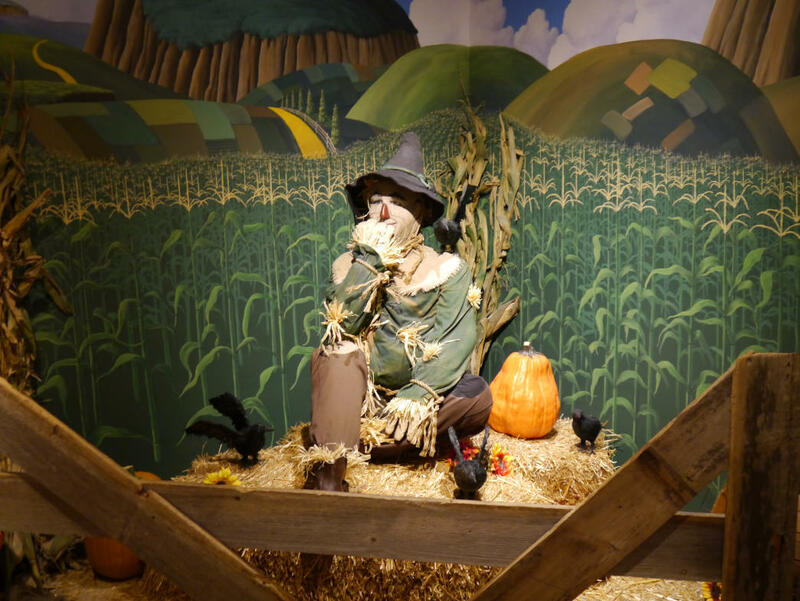 The famous Oz Museum is about 150 miles northeast of Wichita in Wamego, dedicated to all things Oz. The museum has memorabilia from the film, a first edition of the original book, hand-painted character masks, and more. This museum is a must-see for anyone—from a casual fan to serious Oz aficionado. Take your OZ-ession a little further and check out OZtober Fest (in October) when the town is filled with family-friendly activities. The Wamego Riverfront Park is also worth a stop. Hang out and relax a while, or go out and paddle on the scenic Kansas River Water Trail, one of two of the state’s designated water trails. Kansas is the only state to have two river trails with this designation! Just make sure to bring a kayak if you want to go out on the water (there’s no rental service available here). For another little slice of history, drive 20 minutes from Wamego to the Oregon Trail Nature Park (yes, that Oregon Trail). You’ll drive on what actually was the pioneer trail to get into the park, and then you’ll find three short loops. As you look over the Kaw Valley, keep an eye out for birds of prey like red-tailed hawks, northern harriers and turkey vultures. And make sure you walk all the way around the silo. You will find a three-part mural drawn around it, depicting a bison hunt, life on the Oregon Trail and the wildlife of Kansas. If you skipped the water activities in Wamego, don’t worry. For a picturesque and peaceful getaway spot go to Lake Shawnee in Topeka, a 39-mile drive east. You could easily spend an entire day here, playing in the water and exploring the gardens, but we still have road to cover to complete this three-day Kansas adventure. 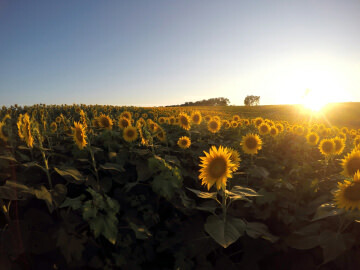 Plan your trip in late summer (when the flowers are at their peak) and make a quick stop to catch the golden hour or a stunning sunset at Grinter’s Sunflower Farm in Lawrence. Chances are, if you’ve seen a picture of a sunflower field in Kansas, it’s from Ted Grinter’s. While you’re at it, get a bouquet to remember your trip. It is just one dollar per flower, on the honor system. The last push is 32 miles east on I-70. You will end up at the Brew Lab in Overland Park where you can celebrate the end of a great road trip by creating—and drinking—your very own brew. Then kick back, relax, and dream of your next road trip through the Sunflower State. Originally written by RootsRated for Kansas Department of Wildlife, Parks, and Tourism.